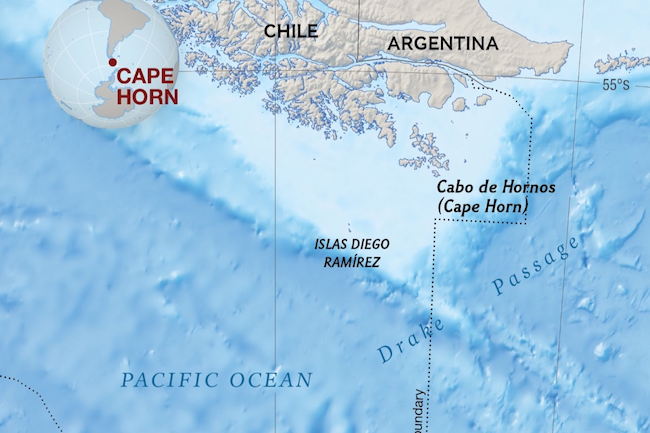 Cape Horn at 55°58′ S, 67°16′ W Moore will attempt a new route across the Cape Horn in Chile, the renowned graveyard of ships. At the southernmost tip of South America, the Pacific Ocean and the Atlantic Ocean meet at the maritime boundary south at Cape Horn. "This is a new swim. I hope to be the first person to swim the one mile imaginary line that separates the two oceans without any land in any directions. With water temperatures of between 6-9°C, the strong wind conditions and remote location mark it as one of the most difficult swims in the world." The Beagle Channel is one of three navigable passages through South America. The channel’s eastern area forms part of the border between Chile and Argentina while its western area is entirely within Chile. "The swim planned is from Italy Glacier in Tierra del Fuego to Isla Gordon, a 2 km crossing of the Beagle Channel. This is a new challenge. One other person has completed this swim and I plan to do a double crossing, if weather permits." The Strait of Magellan is a 5 km body of water that is known for its currents and cold conditions. Before the Panama Canal opened in Central America, the Strait of Magellan was one of three navigable sea routes connecting the Pacific Ocean and Atlantic Ocean.